On Thursday 26 June 2014 more than 200 officers joined forces with partner agencies to conduct a joint cross border operation. More than 100 vehicles, together with air support, were involved in the operation. The intention was to reduce criminality by denying criminals the use of the roads, to identify and prosecute traffic offences, and to build relationships with the community and partners. Hundreds of vehicles were stopped on the Cheshire-Manchester border in the biggest joint roads policing operation GMP and Cheshire Constabulary have ever conducted. The primary tactic of the operation was to utilise both mobile and static ANPR (automatic number plate recognition) assets to identify offences, together with targeting hotspots of criminality in both policing areas. PVL UK supply all of the reflective battenburg livery for the North West Police region including the forces in this joint operation. However there were some differences in design over the fleets. Most notably was the now standard “black ANPR Interceptor” bonnet that was not previously used on Cheshire Police units. 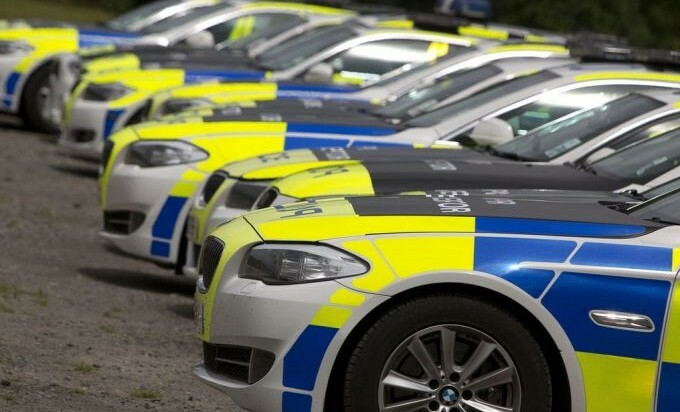 As this operation posed an urgent operational requirement Cheshire Police needed to upgrade their bonnet livery on live vehicles within a very short time to ensure standardisation for the operation. PVL UK worked with Cheshire to ensure enough units were batched together to meet the time frame but also that operational effectiveness of the fleet was not compromised. Overall PVL UK upgraded 12 vehicles in a 2 day period and a 3 day mobilisation. This meant from initial enquiry to finishing the work was 5 days. Will Clarke, Sales Director at PVL UK said “The urgent nature of this project and its successful completion was possible because of our collaborative approach with our clients and the flexibility of our staff. We have been working in this sector for many years and understand how projects like this can be delivered to everyone’s satisfaction”. John Heussi, Head of Fleet Services at Cheshire Police said ”We were impressed by the technical assistance and quick turnaround time for the markings used on this project. PVL’s response was first class”.